– compliance / KYC, specially in the banking sector. 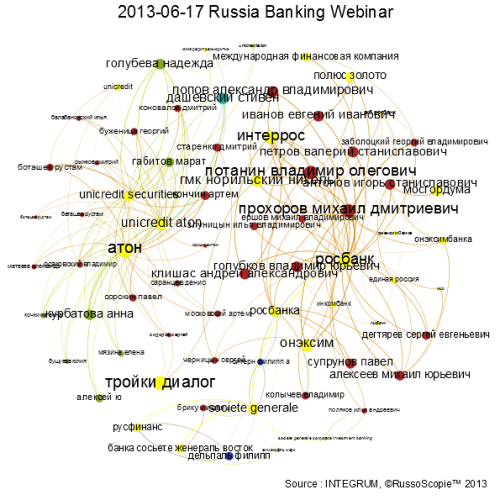 NamSor, combined with RussoScopie/INTEGRUM, provides a unique capability to analyze the position of the international business community and the current status of Foreign Direct Investments in Russia. RussoScopie provides access to INTEGRUM, the leading electronic collection of Russian and CIS mass media – with exclusive distribution rights in the French speaking countries and non-exclusive distribution rights elsewhere (in collaboration with Integrum WW). INTEGRUM professional databases cover Russian newspapers, magazines, teletypes of information agencies, analytical and statistical bulletins, texts of laws, decrees, blogs etc. INTEGRUM offers a unified search engine, automatic translation to English, topics monitoring, text analytics, RSS feeds and much more. This includes Russian media published in different countries, such as: Azerbaijan, Armenia, Belarus, United Kingdom, Germany, Georgia, Israel, Kazakhstan, Canada, Kyrgyzstan, China, Latvia, Lithuania, Moldova, USA, Tajikistan, Uzbekistan, Ukraine, Czech Republic, Sweden, Estonia. 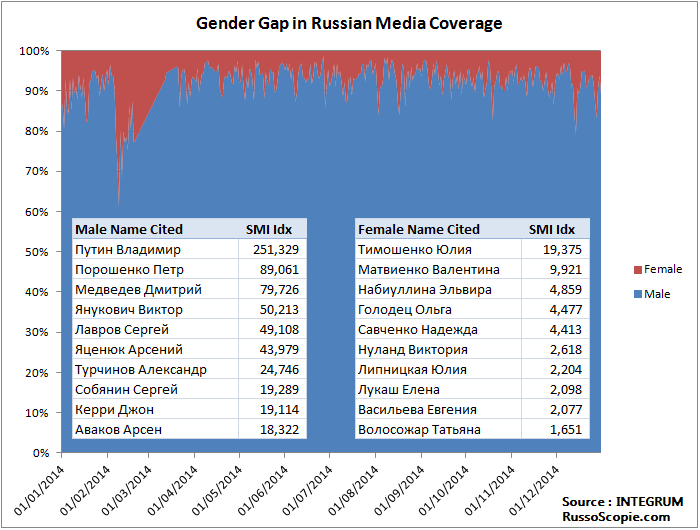 Combining INTEGRUM with NamSor can generate unique insights into what’s on top of the agenda in Russia -as reflected by traditional and social media- across all industries, in a specific sectors, as well as in external affairs. We provide financial institutions, corporate clients, governmental bodies and consultants with databases, innovative tools and robust integration patterns to implement an effective business intelligence strategy focused on the Russian market. – text and data analytics to support a particular decision making process. We help you leverage your existing contacts, professional databases, social networks, consultants. We use tools such as sociolinguistics and graph theory to help you reach your objectives and get access to the right people at the right time. NamSor™ Applied Onomastics is a European vendor of Name Recognition Software (NamSor sorts names). NamSor mission is to help understand international flows of money, ideas and people. Russian tourists are affected by the Russian Rouble exchange rate and may desert France as a skiing destination. This effect will be most painful in January, when Russian Orthodox Christmas generally helps compensate the end of the French holiday (read further here). The drop could be anticipated and measured well in advance using the ‘big data’, for example by looking at the indication of interest recorded by Russian search engine Yandex.ru (equivalent to Google Trends). The year-on-year change in interest has reached 30% to 40%, when the peak for booking is generally mid-December. This is bad news for hotels, restaurants and skiing resort, still relying heavily on a successful winter season for their yearly income. The reversal in interest could be observed as early as July 2014. For skiing resorts equipped with a CRM (customer relationship management) or the larger players in the hospitality business, it is now possible use ‘predictive analytics’ to analyse customer data, combine with other ‘big data’ indicators measure external effects on occupation rates and pricing. NamSor™ Applied Onomastics is a European designer of name recognition software. L’impact de la baisse du rouble sur l’affluence dans les stations de ski des Alpes devrait particulièrement se faire sentir lors de la période du Noël russe, début janvier (Le tourisme russe abandonne les stations de ski autrichiennes [lien]). Une baisse qui est déjà possible de mesurer par avance à l’aide du ‘big data’, par exemple en regardant les indications d’intérêt recencées sur le moteur de recherche Yandex.ru (équivalent de Google Trends). La baisse d’intérêt d’ores et déjà dépasse 30 à 40%, alors que le pic des réservations en ligne se fait généralement mi-décembre. Une mauvaise nouvelle pour les hôteliers et la restauration, qui dépendent beaucoup du succès de la saison hivernale. Le renversement de tendance pouvait être observé dès le mois de Juillet 2014. Pour les stations ou les acteurs du tourisme équipés d’un outil CRM, il est désormais possible d’utiliser un outil de ‘predictive analytics’ pour analyser les données client, combiner avec des indicateurs ‘big data’ et mesurer l’impact potentiel sur l’affluence et sur les prix. It’s not every day one hears the voice of Tolstoy, expressing himself in French. It didn’t occur during a session of spiritism, but during an interview organized by KazTV at the ‘Institut des Archives Sonores’, Paris. Thank you Mr Edison! This institute, created by Franklin PICARD, resulted of the merger of two large private collections of voice recordings from all over the world. Where do they come from ? From the grave, but before that – where did they come from? Onomastics, the science of proper names, is a powerful tool to search in such archives the origin of the voices. The often belong to several origin, if you think in terms of geography, or political boundaries or culture: the voice of President Kennedy is the voice of America, but it’s also the voice of the Irish Diaspora. 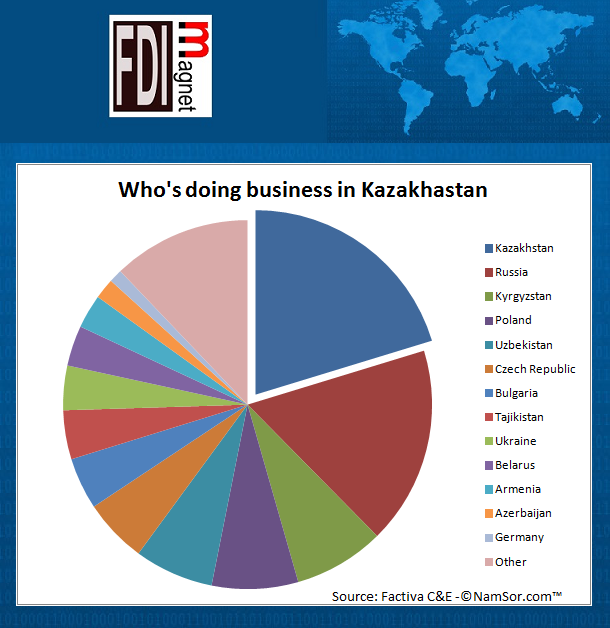 Ethnic Russians represent the largest foreign business community in Kazakhstan, according to a study of company directors names conducted by @FDIMagnet. Several EU countries have large business communities as well: Polish, Czech, Bulgarian, German expats or businessmen represent a significant share of Executive Directors and Board Members of the largest companies incorporated in Kazakhstan. The latest events in the Ukraine and the Crimea, as well as the tensions between Russia and the West, continue to attract attention of media and social networks. Integrum World Wide offers you an automated monitoring and analysis of the information related to these events. With our services you will be able to track information and view analytical reports configured according to the present Themes of your interests in real-time. “My Integrum” performs 24/7 automated monitoring of many thousands of newspapers, magazines, newswires and other mass media of Russia, Ukraine and the FSU states. “Integrum Social Media” service provides 24/7 monitoring of the most popular social networks including Facebook, Twitter and Vkontakte. Your Integrum’s personal customer managers will assist you in setting up your personal Themes for monitoring. A number of Themes and Objects related to monitoring of these events have already been set up. Taking into account the growing interest in the ongoing situation, special discounts will be offered for our subscribers. Last year, @RussoScopie had co-organized a seminar on ‘Geopolitics – Russia, Energy & the Arab World‘ with Paris I Panthéon Sorbonne/ENS with the participation of Gazprom, IEA, evolutionenergie, araprism. 9 h 30 – Accueil des participants – Accueil boissons chaudes & madeleines. 10 h – Allocution d’ouverture : L’Etat et les entreprises, même combat ? Emmanuel Ly-Batallan | Directeur Adjoint à la Direction des entreprises et de l’économie internationale, Ministère des Affaires Etrangères. 11 h 10 – Table ronde I : La diplomatie des villes et des régions : entre appui de l’Etat et stratégies autonomes. Pierre Andrieu | Ambassadeur pour la Champagne-Ardenne et la Lorraine, Ministère des Affaires étrangères. Rachel Haab | Directrice Europe, Relations internationales et Coopération, Région Rhône-Alpes. Chantal Poiret | Ambassadrice pour la Haute et Basse-Normandie, Ministère des Affaires étrangères. Branislav Stanicek | Administrateur auprès du Comité des Régions, Bruxelles. Alexandre Papaemmanuel | Responsable commercial – Renseignement, Airbus – Defense & Space. Laurent Paupe | Chef de projet Due Diligence, Agence pour la Diffusion de l’Information Technologique (ADIT). Thierry Taboy | Vice Président, Responsabilité Sociale d’Entreprise, Orange. Borina Andrieu | Directrice du Développement International, Wilmotte & Associés. Elian Carsenat | Fondateur de NamSor Applied Onomastics. 17 h 45 – Allocution de clôture : L’Union européenne, l’action politique extérieure au diapason des relations économiques ? Yann Richard | Directeur de l’Institut de Géographie de la Sorbonne. Bonne année ! Happy new year ! С Новым годом! RussoScopie est heureux de vous présenter ses meilleurs vœux pour la nouvelle année. Happy new year ! С Новым годом! Combien de français et de russes vivent aujourd’hui loin de leur pays ? Combien passeront le Nouvel An à Paris, à Moscou ou à Dubai? Que peut nous dire Twitter? Nous le découvrirons ensemble à la rentrée. How many French, Russian people live abroad today? How many will travel and spend the New-Year in Paris, Moscow or in Dubai? What can Twitter tell us about it? We’ll discover it together in January.